So after many years of promising the good woman I would build her some cabinet/bookshelves, I have finally begun that daunting task. I have never tackled a furniture project before, but having spent many years making custom presentation case for firearms, I thought I’d give it a try. Here is a Stetchup drawing of kinda what I’m trying to achieve. The drawing lacks the doors that will be on the bottom cabinets and any molding trim top and bottom. But hopefully it will give you an idea. Material will be 3/4” Mahogany ply, and solid Mahogany for doors, trim, faceframe and moldings. It’s tricky to say the least to even get the wood I need for the project into the shop, much less build the project. So I have decided to split the project into two parts, the base including top, and the shelves. The units will be modular to allow for easy moving around the shop and transportation from my shop to my home (about 8 miles). The drawing above is of one cabinet/bookcase unit. Another make up the set to stand either side of the fire place. 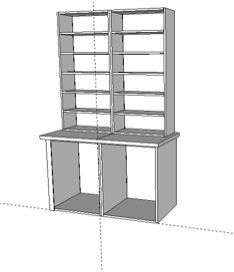 The overall dimensions will be Base (h=30”, d=24”, w=48”) and shelves (h=60”, d=12”,w=45”).